Assassin's Creed was at risk of backing into a creative corner. The third game slimmed down the climbing and combat into single button prompts, offering even less interaction than its predecessors, and while we lapped up living the life of a pirate in last year's Black Flag , it seemed fairly obvious that the series wouldn't just keep its focus on naval combat every year until the end of time. Unity feels like it could solve a few of my long-standing issues with Assassin's Creed's overwhelming simplicity by having a rethink of a few outdated ideas around combat, platforming and stealth. It's also married to a backdrop of the French Revolution that really suits the series' storytelling needs. Before my hands-on, I'm shown the same stuff demoed the Microsoft conference at E3 , with new protagonist Arno Dorian free-running across some rooftops before wandering through a square occupied by hundreds of bustling NPCs. It's the first sign Assassin's Creed's world-building has stepped up in detail, since Unity isn't being made for nine year-old consoles. This leads to an assassination in a massive town square, where Arno drops down and takes out his target. Throughout the demo we see Arno moving in and out of interior locations seamlessly, another benefit of being targeted for console hardware that's closer to a PC standard. When I take control, it's essentially a chance to explore the area surrounding Notre-Dame and to understand how the open world works. Gone is the clunky and imprecise drop down process when you want to get off of a rooftop and hit the ground running: now you free run down structures instead. I move the stick and hold down B on an Xbox controller and Arno free runs across the side of the building, meaning Assassin's Creed now offers the same responsiveness in movement whether you're climbing up or down. Unity isn't a reinvention of Creed's platforming, if you were angling for a full revamp, but this will make chases a lot more fun and less automated. You suddenly have a better way of escaping pursuing soldiers than jumping in bales of hay; holding down B at least partially solves that seven-year contrivance. “For navigation, we definitely wanted to give more control,” says Alexandre Amancio, creative director. “We felt that we tried to guess a little too much what the player wanted. Whenever you try to guess what the player wants, you have a percentage of chance that you get it wrong. And that's what generates these frustrating moments when you're trying to tail a character and you get stuck on the wall, right? So we're trying to guess with one button, what the player wants to do in any given situation. So by adding that second layer of control—free run up or free run down—we're just adding one button, but it's eliminating a lot of problems. Now, not only does it give the player more agency, it removes the need for those haystacks,” which means getting around is more in the player's hands, which I notice almost straight away. It feels really good to climb up and down from buildings, now. Since you can also wander seamlessly through interiors in Unity, anything that can make that feel less awkward is welcome to me. It's odd just how accustomed players got to such bizarre fundamentals in the series, and I'm happy they're being addressed. I don't get much of a chance to sample stealth in the demo where players can now move in cover around rooms, but I like the feel of combat, and no, I didn't find countering to be quite as easy. 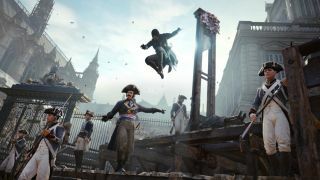 There will be progression systems in player skills that can hopefully keep the combat feeling fresh, but Ubisoft actually wants it to be trickier to renew the player's focus on stealth and strategy. I haven't played enough of Unity to call the success of that either way, but I admire the intent to forge a slightly different identity for Assassin's Creed as the potential of what they can do with the tech suddenly increases. Exploring the open world is made fun by the sheer amount of people everywhere, and the promise that every interior is just woven into the overworld for Arno to explore. I end the demo inside Notre-Dame. The detail and various colouring on the walls is really impressive, implying some hard research by the art team, and the lighting effects are obviously the series' best to date. I like that Paris during the French Revolution is such a contrast to the tropical backdrop of Black Flag. There are different factions within the city, and incidental events like protests going on around you to relay the feeling of uncertainty that hangs over the story. There are murder mysteries to solve, too, giving me hope that the city will just feel a bit more realistic than those of past entries. Unity is attacking a few of my long-held bugbears with the series, presenting solutions to odd bits of design that we've been putting up with for years. There's an awareness that Assassin's Creed can to be improved, here, and in my hands-on I got some real evidence of how Ubisoft is doing it. The co-op side of the game is something that still seems a bit vague to me, and it wasn't part of the demo – they tie into a more open-ended structure to certain types of missions, which I'm sure we'll learn more about before release in October. If Assassin's Creed had manoeuvred itself into a corner by stagnating creatively, though, I now see a way out of it for Ubisoft, and revising the basics of the series was the best place to start.